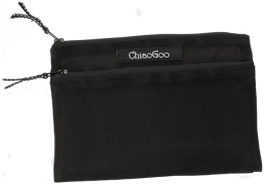 The ChiaoGoo accessory pouch is a compact 2-pocket, black sleeve mesh pouch that fits easily inside the ChiaoGoo interchangeable case. Pouch dimensions are approximately 6.5" x 5" (17 cm x 13 cm). Q: Would this be suitable for holding all the original cables (and perhaps a couple extras) in the Chiaogoo case? I have mine in a sandwich bag because it was easier than the original plastic bags, but I’d love something classier. But that case already seems to bulge as it is. This case will hold several of the ChiaoGoo cables. Q: What does "no tip sleeve mesh" mean? The individual words are clear, but together? I'm sorry for the confusing description. I eliminated the "no tip" wording. What that meant was that there is no individual slots for tips inside this accessory pouch.